Nearly 14 years after Michel Rowe suffered a serious motorcycle accident, he was tricked into entering a rehab facility claiming to specialize in treating persons with head injuries. 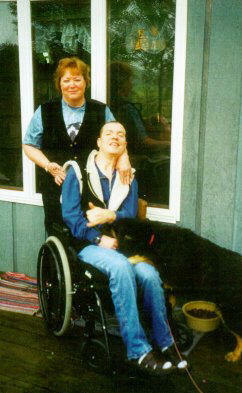 The Social Worker led him to believe he would receive job training and gain independent living. He wanted both! What happened instead is Mike lost his freedom and he may yet possibly lose his life. Mike is held prisoner, a guardianship Ward, isolated from his family and friends, languishing in a facility against his will, needlessly drugged. As a result, the recovery Mike so bravely fought for has been lost. He can no longer walk, has little strength, and can barely stay awake during the day. His spirit is broken, he feels alone and frightened. He’s lost hope. An independent investigation discovered that unbeknownst to Michael or his family, the guardian, Guardian Inc., filed a successful $10,000,000 suit in Michael’s behalf. Think Michael Rowe will ever be free? Well, there’s a chance. When the ten million dollars is gone, perhaps the guardian will be too. Pray Michael Rowe can last that long!